While the idea of a “best overall” keychain is fairly subjective, we’re big fans of this simple, stylish, and effective keychain from Maycom. This classic keychain succeeds admirably at the task of keeping your keys (and whatever else you decide to attach) safe and secure, and the carabiner makes it easy to connect to any item with a strap or hook. It’s made of highly polished chrome for a simple and modern look and can be purchased in black, bronze, copper and matte or polished silver. The carabiner is joined to the actual keychain by a short spring, giving you two options for attachment. Customers describe the Maycom Retro as the perfect keychain thanks to its smart, classic design. Attach it to a bag, a backpack, or even a belt loop with the carabiner—it’s much more versatile than your average keychain. It’s an especially great choice for anyone with a wallet or second item that they’d like to keep attached to their keys at all times. Whether you live hours away from your BFF or just down the road, best friend keychains are a timeless way to commemorate your friendship. The Fiercewolf Matching Best Friend KeyChain comes with two interlocking puzzle piece keychains imprinted with “Best friends are always close in heart” and “Side by side or miles apart.” Each set comes in a gift box so it’s perfect for birthdays, holidays, or just about any occasion. It’s large enough to hold multiple car keys but thin and light enough for everyday use. Reviewers love that the Fiercewolf Matching Best Friend KeyChain is perfectly packaged in a ready-to-gift box and doesn’t easily tarnish or scratch. For less than $10, this is a perfect gift for friends of all ages. Most people are probably familiar with cheap, chintzy dollar store keychain lights that burn out after a couple of days. If you're looking for a handy light to keep on you at all times, the Energizer LED Keychain Light is a huge upgrade from the dollar store model. This pocket-sized flashlight uses alkaline batteries for long-lasting illumination capable of reaching a distance of 18 meters. The lifetime LED never needs replacing (two Energizer lithium coin batteries are included) and delivers 13 lumens of light with three modes of operation: high, low, and flash. The keychain easily clips to keys (or a zipper for quick access) and can be used continuously for two hours before it’ll need a change of batteries. 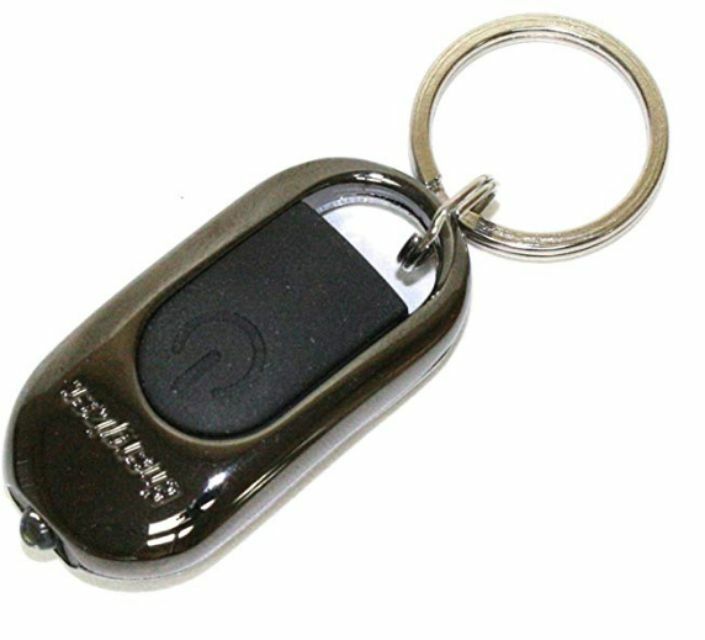 Customers say the Energizer LED Keychain Light is surprisingly powerful for its small size and comes in handy whenever you unexpectedly find yourself in need of a flashlight on the road or around the house. The ability to replace the battery makes it a long-lasting purchase, especially compared to standard keychain lights, and the multiple modes make it more versatile than most traditional full-sized flashlights. If you're in the market for a full-sized option that you can recharge, check out the best rechargeable flashlights you can buy right now. It’s a bird! It’s a plane! It’s...a keychain? Okay, that might be a bit of a stretch—but the CRKT Eat’N Tool Outdoor Spork Multitool comes close. This uniquely shaped keychain can be used as a spoon, a fork, a flathead screwdriver, and a bottle opener, making it the perfect addition for any camping trip or outdoor excursion. A large central hole makes the tool easy to grip, no matter how it’s being used, and the elegant, multi-functional design means you won’t need to dig far into your backpack to find what you need. Clip on your keys via a carabiner, then snap it onto your pack or jacket for quick access on the go. While it’s a bit pricier than most keychains (it still rings in under $12), it comes with a one-year limited warranty covering defects. The tool can also be purchased in black, titanium, tangerine, silver, or fuschia, and is also available in a larger size. Customers say the CRKT Eat’N Tool is “just right for eating that emergency can of pork and beans,” with a bevy of basic survival tools all in one unique instrument. Made with the same craftsmanship you’d expect from a company known for survival tools and hunting gear, you can rest assured that this little keychain will stand the test of time. Say goodbye to your flimsy keychain bottle opener. The Fencher Keychain is as easy to use as the one you keep in your drawer, with heavy-duty construction that ensures you’ll be cracking beers without the struggle often associated with keychain bottle openers. It’s also highly durable, with an anti-scratch surface that ensures it’ll retain that brand-new look, and includes both a large and small keyring that can be detached from the bottle opener with a single press. It also hooks onto bags or belt loops via a carabiner-style clip. According to online reviewers, the Fencher Keychain is solid and well-made with a good weight to it (just over two ounces) that makes it much easier to use. The inclusion of two key rings is another benefit, allowing owners to organize their keys and other items and avoid searching around their bag. Looking for a keychain with a touch of elegance? Madewell’s Front Door Key Fob has a leather strap and collar-stud closure that gives it a sophisticated look far beyond your average keychain. Using real leather (no faux-materials here), it’s available in brown or black versions, and can even be personalized. The hardware is also of higher quality than you’ll find on most keychains, with a matte gold clip that makes a stylish statement when it comes out of your bag. It includes both a keyring and a multi-functional clip. “I know it’s just a keychain, but I love it,” writes one Madewell shopper. "The leather and gold combo looks great, and the clip component makes it easy to attach to a bag on the go." Just bear in mind that if you get it monogrammed, it will take a bit longer to ship. Personalization doesn’t end with putting your name or initials on a keychain strap. With Anthropologie’s Monogram Keychain, you can choose any letter of the alphabet to serve as the keychain itself. Each letter has a modern, typewriter-inspired look, and includes a jewel-like glass bead and tassel for added flair. It includes both a key ring and clip, so it hooks right onto any strap, and the letters come in one of four color schemes. Customers say Anthropologie’s Monogram Keychain is super cute and slightly larger than you’d expect, measuring 7.25 x 3-inches—making it a fun accessory as well as a great gift or stocking stuffer. For more personalized gift ideas, check out our list of the best customizable notebooks. Whether your child is getting his or her very first front door key or you’re hunting for a cute way to decorate a binder or bookbag, your kids will love the Nuoxinus Emoji Plush Pillow Keychain. Each set comes with six different fun mini stuffed emojis (yes, even the poop emoji is included) that can hook onto a zipper or a key ring. Each stuffed keychain measures about 2.5-inches and is made from soft plush fabric. If your child is emoji-obsessed, surprise him or her with a set of keychains that will make packing a school bookbag a little more fun. Reviewers say that for less than $10, this set is not only incredibly affordable but a great surprise gift for kids (and those who are kids at heart). No matter your age, these emoji keychains are sure to bring a smile to your face. Looking for more surprises? Here are the best super hero toys for kids of any age.